Oceanus is the perfect place to host your next family reunion, corporate retreat, or special event. This villa rental is on the quieter South side of the island. It has sleeping arrangements for 21, an elevator that travels to all four levels, and a huge outdoor area. The terrace is multi-leveled and has something for everyone, so your guests can get as much privacy or socialization as they want. There’s an Apple TV in every bedroom, and the third floor bedroom is basically its own apartment. 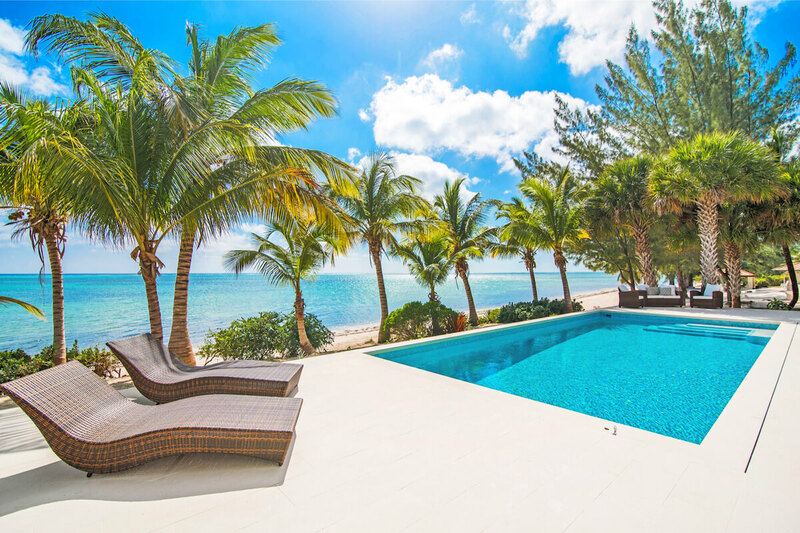 Oceanus is an oceanfront mansion with a modern, open design. Four levels of living space with windows in every room makes this vacation rental perfect for ocean lovers. The gorgeous private infinity pool faces the sea and is bordered by palm trees. Guests can lay out on loungers, nap in the hammock, take a kayak out to sea, or build sandcastles on the private stretch of beach below. In fact, the beach is barefoot friendly and soft turtle grass lines the shoreline. There are two al fresco showers, so guests can rinse off before barbecuing on the 36” gas grill in the outdoor kitchen. The kitchen even has a sink and fridge so guests can prepare meals with an ocean view. There’s outdoor speakers for entertainment, and an outdoor gas fireplace to gather around at sunset. The terrace is multi-leveled and wraps around the sea-facing side of the villa rental. An open floor plan inside combines the living and dining areas with walls of windows that face the ocean. The spacious kitchen is fully equipped with stainless steel appliances, a dual oven, ice maker, and a Keurig. A large prep island in the center of the kitchen is great for cooking meals with fellow guests. There’s a combined gym/game room with shuffleboard, entertainment center, elliptical, and free weights. An elevator connects to all four levels of Oceanus villa, which adds convenience and luxury. All six of the bedrooms have Apple TV, Sonos sound system, ensuite bathroom, and a balcony or terrace access. You will also find spa robes and slippers in every adult bedroom. The spacious Master Suite has a king-sized bed and sofa sleeper so families can share the room without sacrificing comfort, and the suite has easy access to the pool deck. The ensuite bathroom is equally spacious, with an oversized walk-in shower, two WCs, two sinks, and an oversized closet. The second floor has two bedrooms that connect, and two separate bedrooms. One separate bedroom has an ocean and garden view, a king-sized bed, Apple TV, and access to its own oceanview balcony. The second separate bedroom would be great for a family or children, with two queen-sized beds, one twin daybed, an XBOX, and a private oceanview balcony. The two connected bedrooms have king-sized beds and access to a shared oceanfront balcony. The third floor bedroom is a family suite, with a queen-sized bed, two sofa sleepers, and access to a large, private balcony. This room also has a fully-equipped kitchenette. Oceanus is a great choice for special events, on a quiet side of the island. It’s near Queen Elizabeth II Botanic Park, a 65 acre park with gardens, woodland preserves, and tropical flowers. Beach is medium width. The soft sandy bottom begins 100 yards from shore.